As the death toll in Nepal continues to rise, impacting roughly eight million people according to the UN, one can't help but wonder how the country will ever achieve its former splendor after this devastating earthquake. Arch Daily pulled together a series of news reports detailing how the earthquake leveled several historic buildings, many of them UNESCO heritage sites, with absolute impunity. The iconic Bhimsen Tower reduced to rubble. Kathmandu Durbar Square, unrecognizable. And the site of the beautiful Boudhanath Stupa, forever changed. Talk of architecture may seem trivial in this context, but Nepalese architecture comprises an integral part of a rich cultural tradition that has evolved over many centuries. And it is culture, ultimately, that unites a population after tragedy. Earthquakes disproportionately affect people in developing countries, where building codes are less rigorous, so the same buildings that we all know and love are ultimately responsible for greater death and destruction than an earthquake of a similar magnitude (7.8) would exactly in a developed country. Kathmandu’s iconic Bhimsen Tower, for example, killed at least 200 people. 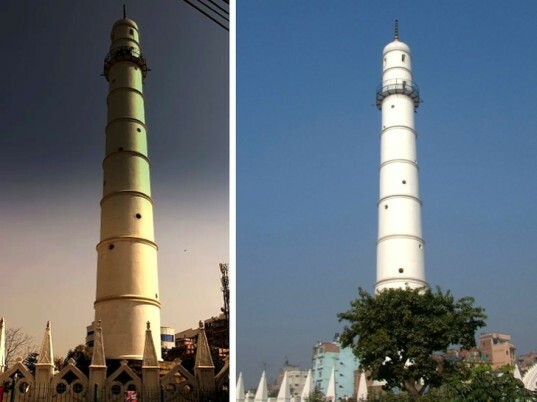 Also known as the Dharahara Tower, it has been reduced from 203 feet tall to just 30 feet. This is not the first time earthquakes have destroyed this particular tower, but it may well be the last. Rebuilding it seems like such a daunting prospect. Kathmandu Durbar Square and Patan Durbar Square are hardly recognizable in the ruins. Many Twitter users shared before and after photographs, and honestly, certain parts of each are devastated to such an extent, it’s hard to believe the photographs are taken of the same places that attract roughly half a million tourists each year. These royal palace squares are all UNESCO heritage sites. They are considered priceless to all of humanity. And now they are gone. 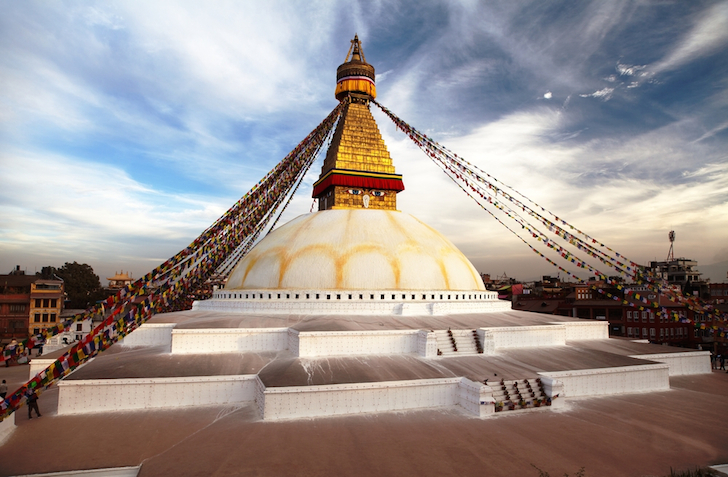 The Boudhanath Stupa, which is considered the holiest Tibetan Buddhist temple outside of Tibet, has also been damaged. While the dome appears to have survived, this site too is largely unrecognizable. Drone footage published by the National Post illustrates the extent of destruction. Our hearts go out to the people of Nepal and in other countries suffering in the aftermath, and we appreciate your continued support. Please consider supporting one of the many aid and rescue organizations helping the victims. Here are some of your options. Images via Shutterstock (1,2), vikkivik/Twitter, Wikimedia (1, 2), cctvnews/Twitter, wikimedia, cctvnews/Twitter. Shown here before the earthquake, the Bhimsen Tower or Dharahara Tower has seen three earthquakes in its storied lifetime. The 2015 Nepal earthquake has reduced the Bhimsen Tower to a 30-foot pile of rubble. The Kathmandu Durbar Square is one of three royal squares and a UNESCO heritage site, shown here before the quake. Kathmandu's Basantapur Durbar Square is shown here in better days, when these iconic buildings stood in all their splendor. This is what the Kathmandu Durbar Square looks like today. The Patan Durbar Square at night - before the earthquake. Patan Durbar Square is unrecognizable in the aftermath of the massive earthquake.